The IndyStar reports in Lawsuit in Fatal School Bus Crash Focuses on Seat Belts, that the family of Michael Watkins, Lenae Watkins and Neveh Hobbs filed an automobile accident lawsuit against the Miller Transportation, Inc. Miller owns and operates the school bus involved in the March 12 collision which took the life of another student (not named in the lawsuit), Donasty Smith. The bus collided into a concrete pillar. 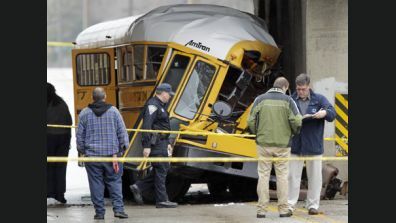 The lawsuit includes claims that Miller did not adequately inspect the bus. At this point, the police have inspected the wreck and concluded that the bus passed inspection on January 3, and there was no indication of anything faulty. However, the plaintiffs are obviously preserving their claim and their right to have their own experts inspect the bus. The lawsuit also makes claims that Miller did not adequately monitor the health of the bus driver, who died in the collision. The autopsy results have not been released, yet. Indiana’s governor expects that the issue of seatbelts will certainly be raised again in public hearings. The issue is going to resolve mostly around cost, I’m sure. Seat belt companies claim that buses can be safer with seatbelts, preventing injury odds by up to 45%. Some calculations indicate, however, that to improve a single bus costs between $3,000 and $10,000. Some question whether the cost is worth it. Parents don’t wonder.